From now on, the KA42 connection terminal from FTG is ready for safe outdoor installation. With the new protective cap the protection class IP44 is achieved. The terminal with two spring terminal points from 0.75 to 4 square millimeters can thus be used not only in street lights, but also for the power supply of boat docks or campsites. The terminal is still available without the protective cap with IP33 and has the same protection class as the remaining terminals of this street light terminal series, the KA50XX. These terminals were originally designed to distribute power to street lights and loops in 2015, and both aluminum and copper conductors can be connected to the screw terminals. Despite their compact design, for the ring connection currents of up to 160A on 50 square millimeters can be distributed. As output terminal points up to 6 square millimeters are available. Widely used in the Scandinavian market, the series offers the installer space-saving and easy installation. 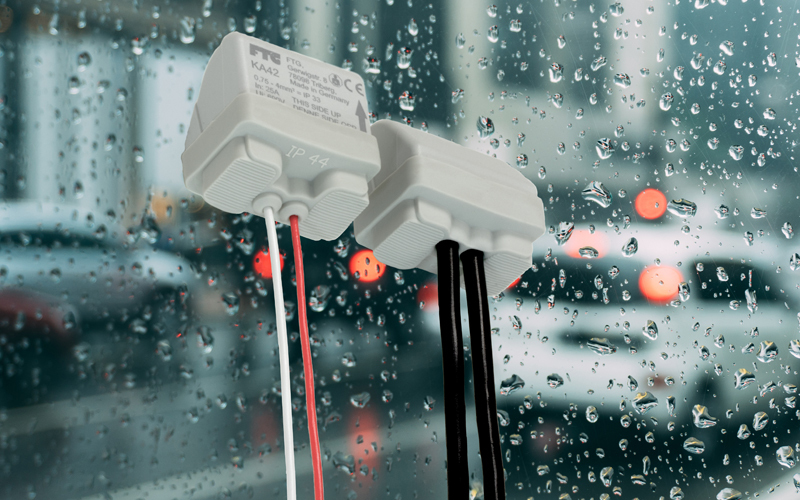 In contrast to conventional connection boxes of street lights, the terminals are a cost-effective and universally protected against splashing water alternative. The complete range of FTG products, which includes numerous other items such as busbars one to four poles and distribution blocks in addition to the street light terminals, is tailored to cost-effective and compact assembly in many types of distribution boxes and is ready for use.